Our list of redneck baby names is probably very politically incorrect and unfair since there is no such thing as an EXCLUSIVE redneck baby name. However, there are those that are favorites of rednecks residing in specific areas of the country. I apologize for putting up a complete list of popular redneck names that I feel are worth mentioning. By some strange twist of fate and with my luck, there will be a pretty little Yankee baby girl whose mom thought the name was a tried and true name for a resident of New England. Ace is a time honored redneck favorite for a boy. A modern twist on this name is to use it to name a pretty little redneck gal! Cephus for a boy, short for Bocephus. Here's a great way to handle naming little redneck twins, call one Bo and the other one Cephus! Dale - As in Earnhardt of NASCAR fame, of course! Harley after Me Maw’s favorite ride, I'm sure. Johnny - One of the most popular male names of all the list of redneck baby names! I wonder how many have combined it with "Reb" or other baby middle names? K Fed after Britney Spears's baby's daddy. No list of redneck baby names should be without the name of a celebrity mom or two. LUKE (short for Luther)- A throwback to the Real McCoy's maybe? Opie - if you've got twins name the other one Andy! QUAID - After many a redneck's favorite actor, Dennis Quaid and his brother Randy. Who can forget that Dennis played the powerful redneck star, Jerry Lee Lewis, in the movie? REBEL - Did you thing this was reserved for a redneck's dog? Think again! Ruby Sue You just have to love any double name with Ruby in the mix! SOOKIE (recently made famous by Sookie Stackhouse in the series "True Blood"
Anything BUT Ulysses - What self-respecting redneck would put their child at risk by naming him after a Yankee General? Wayman, a boy's name with Engish origins means road man or a traveler. This is a tough call, as some day x-con might be what the child is known as! Being a southerner, I realize that the rest of the world probably lumps everybody that lives south of the Mason-Dixon in the Redneck category. To think that all residents of any southern state are rednecks is a huge mistake and anyone who thinks along these lines has never been to an elegant Cotillion dance, a Sorority mixer or a Deb's coming out dance. The names of the attendants of these functions (along with the menu) is a far cry from anything remotely connected to a redneck throw down. A list of redneck baby names and southern baby names are not the same thing! Baby names favored by Southern Belles are most times family names and names of historical and fictional southern heroes and heroines. On the other hand, the most popular list of redneck baby names comes from favorite Cowboy or Country and Western Singers, NASCAR drivers and possibly from the brand name of a favorite pickup truck, motorcycle or car. There's more than one little redneck baby girl that's been tagged by the automobile industry section of the list of redneck baby names. I personally know one little Cassidy Corvette and have seen MORE than a few Harleys. Honey, I'm not talking about two wheeled motorcycles that I've seen riding the dirt roads, I'm saying that there are kids named after their dad's or their mom's favorite bike. I haven't heard of such, but there may even be a few little Kawasaki’s or Suzuki’s toddling around in Pampers and biker logo redneck baby clothes. I have heard that a very trendy and popular redneck baby gift is a mini-chopper to use to decorate the motorcycle or NASCAR nursery theme until the little redneck sweetie pie is old enough to ride alone. For the dad who hunts, camouflage nursery items and camo diaper bags and other diaper bags for dads are big hits as father's day gifts. Yes, dear reader for people with hobbies the list of redneck baby names may be unnecessary. They have only to look in their garages or gun cabinets for inspiration. Another means of populating the list of redneck baby names is to scour the list of the Top 10 songs on the Country Music charts. Bocephus, Crystal and Merle is all Daisy Duke's dream names for a budding baby redneck. Check my list of redneck baby names below and you will see that my favorite beginning with the letter C combines two redneck names to generate the truly unique and special name, Clennis Merle! If there is a set of redneck fraternal twins involved, well; you just might have an Elvis and Priscilla on your hands! Little rednecks can snooze peacefully in a jungle room nursery theme similar to the one in Graceland, the home of Elvis, the King of rock located in Memphis, Tennessee which is the Mecca of rednecks from every country in the world. See what I mean when I say the list of redneck baby names is not just for citizens of the southern persuasion? Apparently, there are rednecks from Japan, Spain and even China squatting on the front lawn of Elvis' mansion just north of the Mississippi state line. 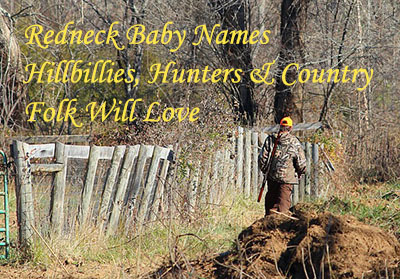 Rednecks and good old boys and girls are loads of fun and they love to give their baby boys names as well as their baby girls names that may sound more like nicknames to most people. That's where I think a lot what we think of as redneck baby's names come from. Where else could a body get a name like Tooty? Talk about funny redneck baby names, this is carrying the practice of assigning nicknames to a new level! Redneck babies are known to be a little gassy. Could it be from the occasional ounce or two of Bud Lite out of the baby bottle? But do they have to put the announcement on the birth certificate? Or could you have it printed on one of the baby’s first articles of redneck baby outfits, a saying on the front of a t-shirt? Family trees are a super redneck baby name generator! Just shake that tree full of nuts and a few treasures are certain to fall out. I thought I'd look through my own list and see if I could find any funny names to add to the list of redneck baby names. Surely there would not be anything other than classy monikers there! I didn't come up with one for each and every letter of the alphabet, but I must say there are some redneck names I can be proud of in the files. I will even share them for you if you promise to drop me a letter and let me know if you use any of them! Send me your redneck baby pictures! I promise I’ll put up a redneck baby picture gallery if you will! This list is a work in progress and I plan to add to the list as time allows and research moves forward, so check back. Or should I say "Y'all come back now! Ya hear?" Alright, there's a whole list of redneck baby names that covers the alphabet! If you can't manage to figure out the alphabetic concept, get help from somebody who made it past the third grade! Otherwise, just print the list of redneck baby names and mark out the ones you don't think will impress the country folks down at the mud flats!